The Maternal, Infant, and Early Childhood Home Visiting Program (MIECHV) strengthens families and communities across the nation with millions of home visits. According to the Heath Resources & Services Administration on Maternal & Child Health, the home visiting program, “gives pregnant women and families, particularly those considered at-risk, necessary resources and skills to raise children who are physically, socially, and emotionally healthy and ready to learn”. The final stretch: once congress returns from August recess, it has fewer than 15 legislative days to reauthorizes MIECHV before it expires. The deadline is September 30, 2017. How Does Reauthorization Impact Kentucky? 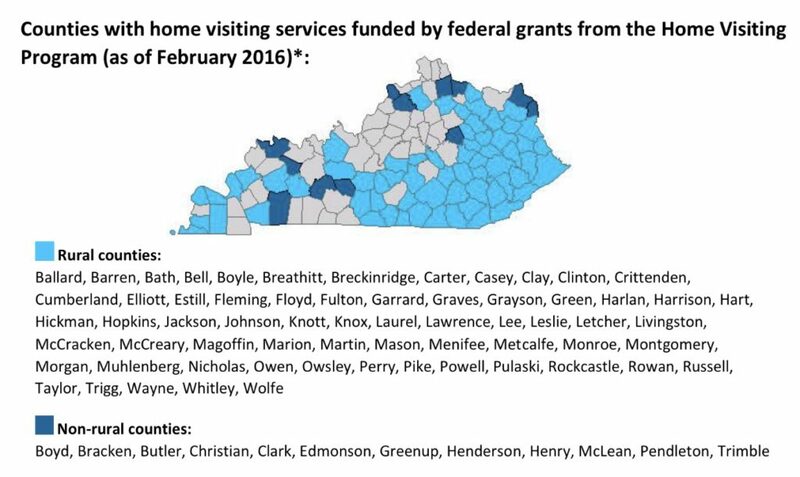 Reauthorization is crucial not only for children and families across the United States, but also for Kentuckians. In Kentucky, MIECHV funds the Kentucky’s Health Access Nurturing Development Services (HANDS) Home Visiting Program. In 2015, HANDS made over 50,000 home visits and enrolled over 1,300 new families into the program. HANDS expanded throughout 60% of the state, reaching 76 Kentucky counties. MIECHV is vital to the success of Kentucky’s home visiting programs. In addition, reauthorization ensures the continued success of the positive outcomes for families and children throughout the Commonwealth. Positive outcomes exhibited include: improved infant mortality rates, less emergency room visits, and increased employment. Notably, 2015 reporting shows 26% advancement in education as well. Recently, the Home Visiting Coalition released an advocacy Toolkit to promote action for reauthorization efforts. There is power in numbers! The more we engage our Congress members, the stronger and more effective we will be. The Home Visiting Coalition’s Toolkit provides creative ways to show why home visiting matters and share various images that outline how MIECHV works.